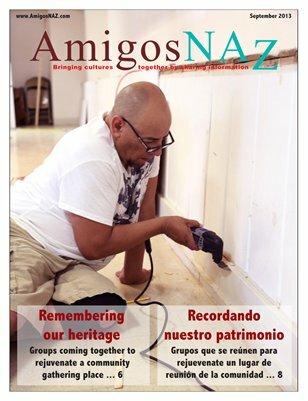 The September 2013 bilingual edition of AmigosNAZ opens with a cover story on the beginning phase of renovations at the Our Lady of Guadalupe Cultural Center — "The Basement" in Flagstaff. The edition also includes an update on efforts at W.F. Killip Elementary School in Flagstaff to take advantage of a Science Technology Engineering and Math (STEM) grant; the decision to keep vital dental services open; the call for applicants for a citizen's police academy; a donation of a historic hotel to Northern Arizona University; a commentary by a county supervisor on dealing with Monsoon flooding and back-to-school issues; a story on Spain's El Camino de Santiago; tips on keeping children healthier at school; ways to cut costs of data plans and ideas for disinfecting water in case of an emergency. All this and more brought to you by AmigosNAZ — Providing information for and about the vibrant Latino community in Northern Arizona.